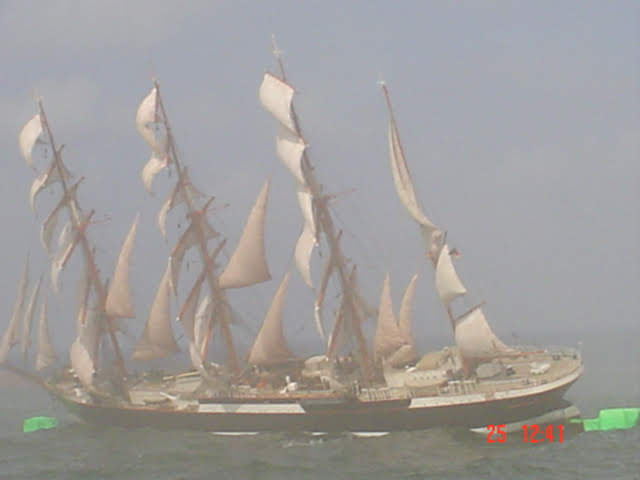 Shipping themes in many forms have long been popular movie subjects, encompassing many genres including swashbuckling pirates, fantasy, historical epics and war. Nearly every major studio in Hollywood used to have its own tank facility to support this. Now most of them have long gone, converted to car parks or the land on which they stood sold off as housing developments . Shooting out in the ocean was an option, one that has been more in favor in recent years, but it well known in movie making that filming at sea is at least three times more difficult ( and 3 times more expensive) than shooting on land. In the golden years of the Hollywood studio system where there was a specialised department for every facet of production, it made economic sense to have a dedicated tank, the cost of which could be amortised over many productions. Fox studios had a tank named after its head of visual effects Fred Sersen which was demolished in 1960 when the land on which it stood was sold off. The original Sersen Lake at Fox. Structure for the painted sky backing. 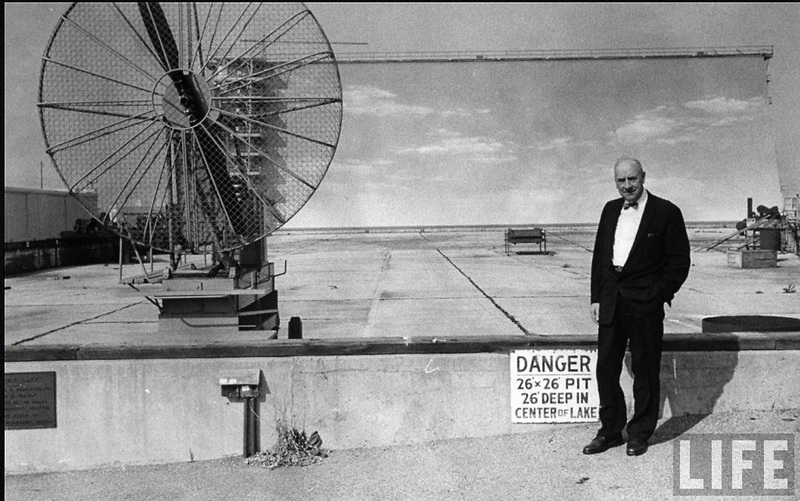 A new and better tank also named Fred Sersen lake was built for Cleopatra in 1962 at the fox ranch at Malibu. The tank contained about 3 million gallons of water at 36 inches deep. 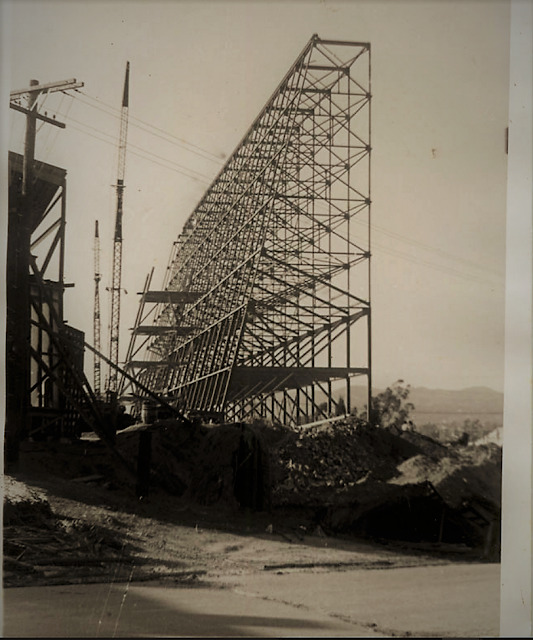 It had sloping sides allowing vehicles to be driven into it and preventing wave echoes from bouncing back. In a straight sided tank, any waves produced would hit the side and bounce back. This can look odd when the two opposing waves meet, ruining a carefully generated wave pattern. The Sersen lake, like many tanks, was trapezoid in shape. 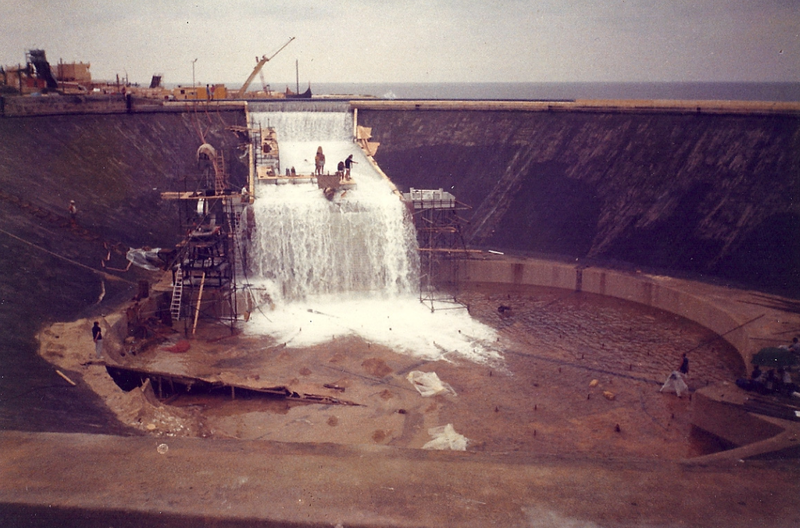 The back wall was the longest at 370 feet and also shorter in height allowing a flow of water over its edge. The water that spills over the curved top is collected in a trough and pumped back into the tank so that there is a continuous flow maintaining a constant water edged horizon.The tank was 300 feet from front to back with the front wall, where the camera is usually placed, much shorter at 198 feet wide. At the back of the tank was a giant screen much like an old drive in theatre, angled back at 14 degrees to catch the sun. This screen was 366 feet wide by 85 feet high covered with plywood panels and a layer of canvas on which would be painted a sky scene. 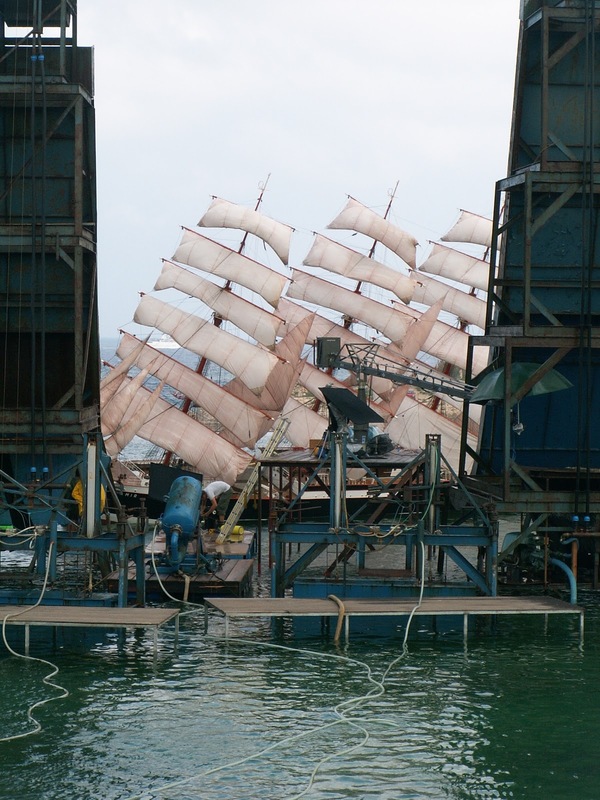 It had an electrically driven multi level platform for use by the scenic artists. 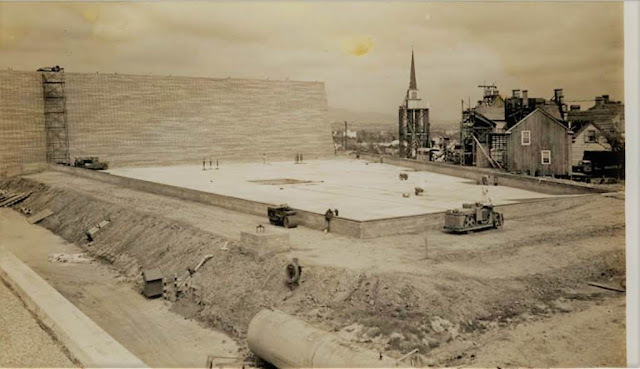 Behind the screen was a reservoir which held 4 million gallons of water and giant pumps which could fill the tank in 100 minutes and drain it in 50. 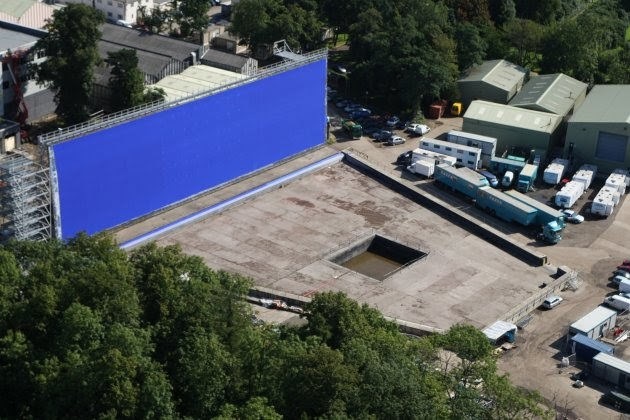 There is a tank at Pinewood studios still in use known as the Paddock tank which is very similar to the one just described. Pinewood's Paddock Tank today note the deeper well in the middle. 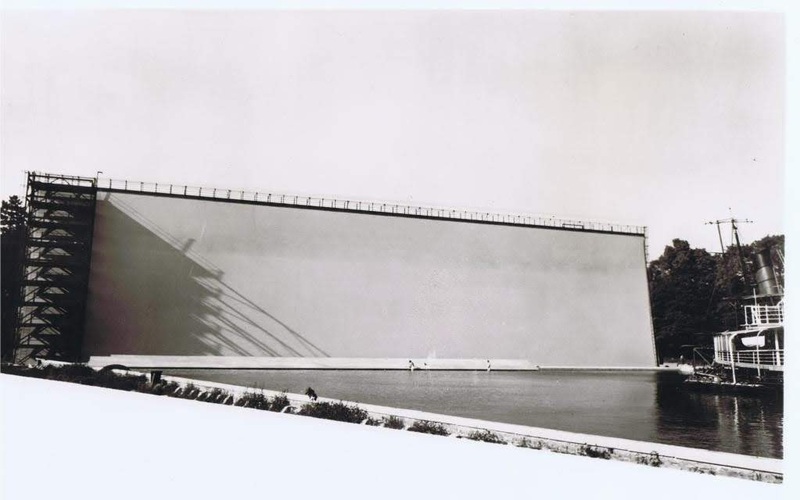 In 1960, Toho Studios in Japan completed a tank known as the "Big Pool". It measures 289 x 236 feet (88 x 72 mtres) and has a depth ranging from 2 1/2 to 5 feet (0.8-1.5 metres). Cinecitta in Rome has a tank 236 x 477 feet (72x 145 metres) and 5 foot deep (1.6m). It has a 282 feet long, 59 feet high (86 x 18 m) backdrop screen. 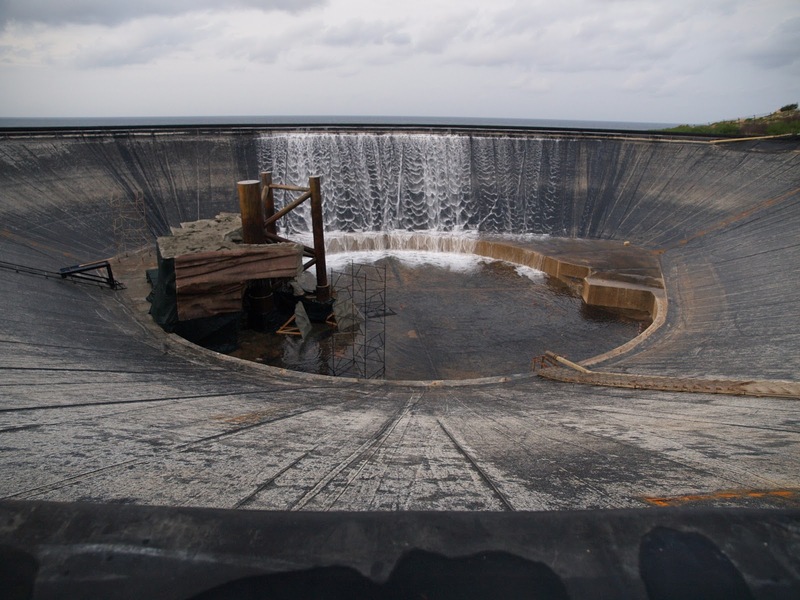 The tank holds 2,720,972 gallons (10,303 cubic metres) of water. One of the most well known tanks for model ship effects is the one on the island of Malta. 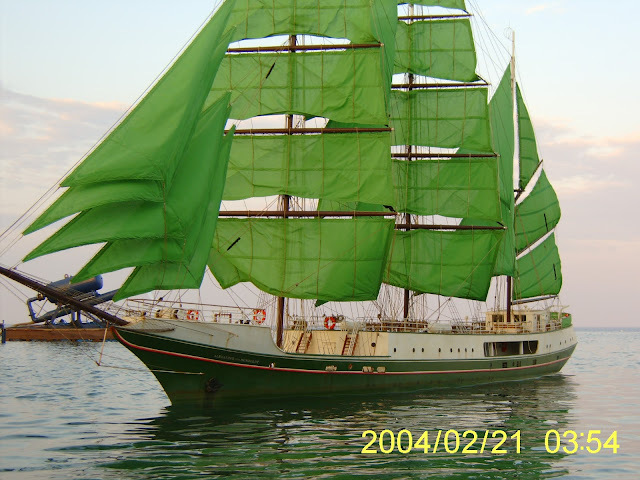 It has been used for many model ship movie visual effects most notably "Raise the Titanic" in 1980. There is in fact three tanks built at this facility two of which have the real sea and sky for a background. The shallow tank is 300 by 400 feet and 6 ft deep with a deeper pit in the centre and takes 8 to 10 hours to fill.. The Deep water tank is more of a rounder shape 354 by 162 ft wide and 36 feet deep, taking about 15 hours to fill. There is also a smaller insert tank 50 by 30 feet and 12 feet deep. 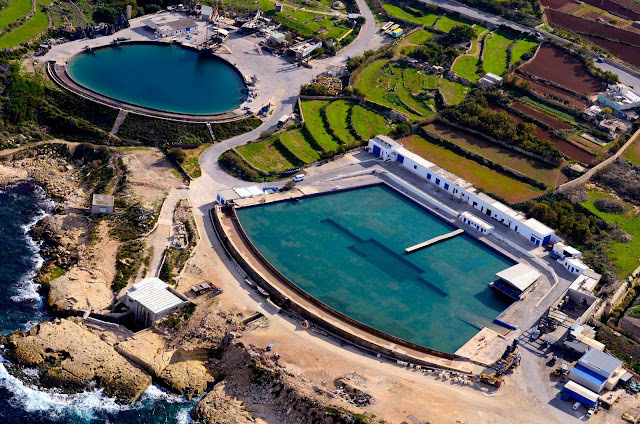 Malta Film Services Tanks Smaller deep water tank top left. In this photo the deepwater tank has been emptied. Note the central deeper pit section in the main tank. Deep water tank being filled. The deep water tank being used for the waterfall sequence for Erik The Viking. 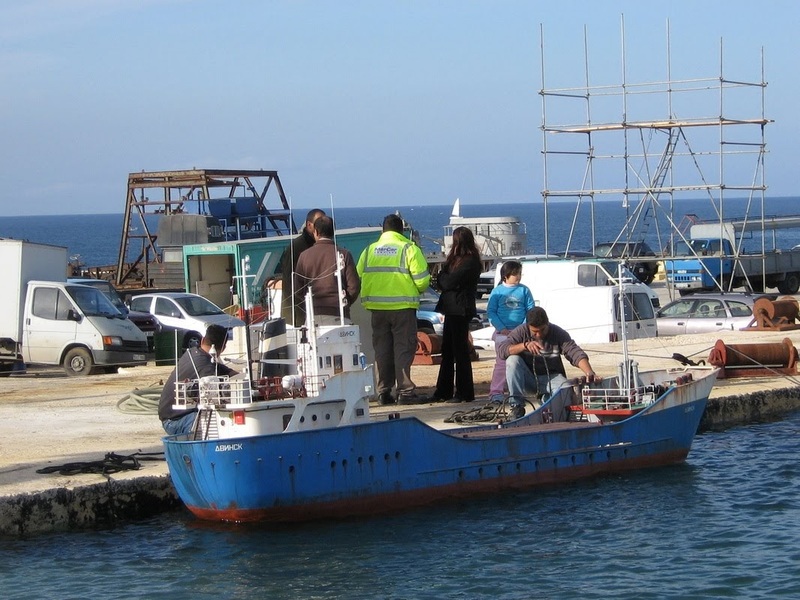 http://www.pcpmalta.com/sfxtankinfo.htmThere is an informative video showing the tanks in use and the equipment used to generate waves and spray. 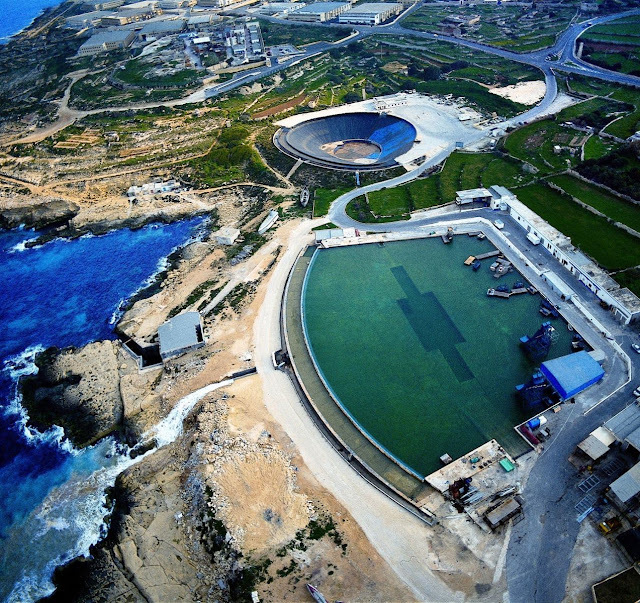 The above photo shows dump tanks, wave machines and various equipment for simulating storms at sea at the Malta tank. The blue cylinders are air cannons which are powered by a large volume of compressed air which can be released instantaneously blasting out a quantity of water into a fast moving spray. The two tall structures either side are the dump tank chutes down which fall a huge quantity of water which is then kicked up into a wave like crashing of water. The other blue structures between the chutes with long thin white pneumatic (or hydraulic) rams are the wave machines which cycle up and down pushing on a shaped displacement volume in the water to produce the rolling swell. 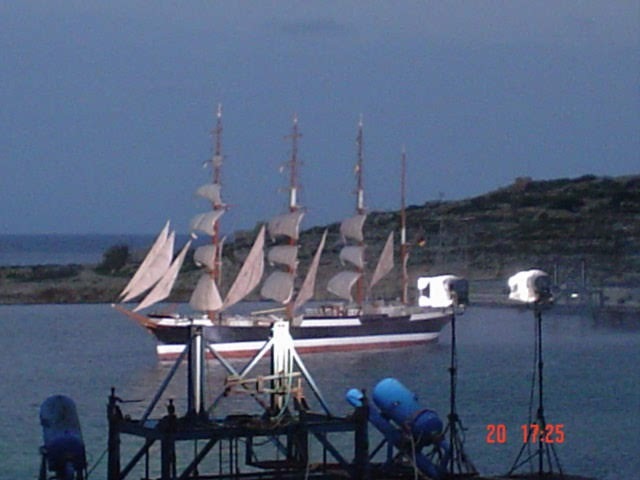 The huge models in the photos have also been constructed at the Malta facility. One of the most important factors in a realistic scene is the breaking up of the water surface. A real ocean is never still even on windless calm day. A small body of water at rest, such as that in a large tank, can be very mirror like in appearance and a dead giveaway of the smaller scale. To be convincing a tank needs waves and wind. The waves can be generated by a squad of effects personnel armed with nothing more than a plank of wood which is randomly pushed up and down in the water producing a general ocean swell. Slightly larger waves can be produced using 44 gallon drums or similar sized plastic drums manipulated in the same way. The finer rippling of the surface is done with large fans placed down one side of the tank. These fans are very tricky and time consuming to place so that there are no dead spots in evidence. The blast from one fan can affect another and the natural wind from the wrong direction can cancel the effect out altogether. If the budget allows a second row of fans can be placed on the other side of the tank so that if the wind shifts they are ready to go saving considerable time in moving and adjusting the fans to the other side of the tank. Sometimes these fans have been made from recycled aircraft with their wings cut off. They produce a powerful blast but are typically incredibly noisy and hard to control. Even old jet engines have been pressed into service, an example being for Ridley Scott's "White Squall", where the storm was whipped into a frenzy of wind and spray by the jet's blast. Motorised and hydraulically powered wave machines have also been developed to generate the base level of wave action. 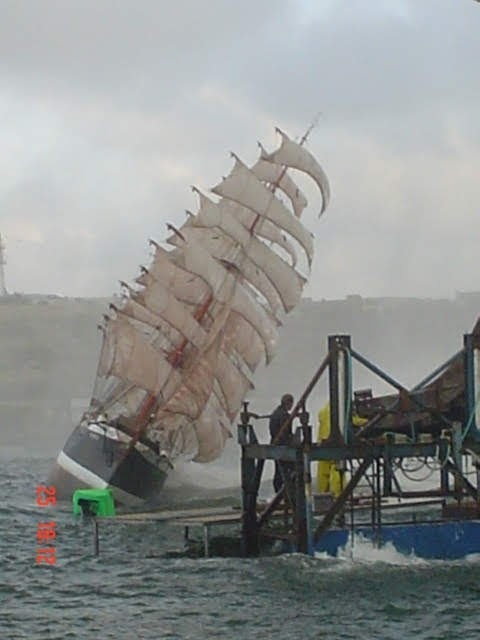 For storm sequences and tidal waves more elaborate equipment is required to produce the larger waves and spray required. The most common piece of equipment for producing a really big wave is the dump tank. This consists of a water tank mounted high up on a tower, able to release all its contents in an instant and a chute down which the released water slides. When the large volume of water drops into the tank it produces a large wave which can travel a short distance before it is dispersed. The model being filmed is placed as close to the chute as possible so that the wave is at its tallest and most powerful when it hits and swamps the miniature. Sometimes the end of the chute is fitted with a kicked up end which rather than dumping the water into the tank, sends it up into the air and looks like a breaking wave. Dump tanks can be adjusted in the amount of water dropped or used in multiples depending on the ferocity of the effect. Rain and spray is achieved with fire hoses and these days the high pressure sprayer or cleaner can be used to produce very fine water drops which look to scale. There has been many attempts to reduce the size of the resulting water drops from all this mayhem which as has already been noted is a major complaint against miniature photography. The size of a water drop is mostly a product of water tension and sometimes detergent is added to the water to reduce this. Only a very small amount should be used as too much starts producing obvious foam. There is foam on sea water but unlike dishwashing foam, salt water foam breaks down very quickly. Floating alcohol, which has a very small surface tension and consequently small droplet, has been tried but proved too problematic, including the fact that it is flammable. The most successful method is in the use of compressed air particularly in a storm sequence. Wherever large droplets are regularly thrown into the air, usually from the bow crashing into oncoming waves, carefully aimed compressed air nozzles can be made to blast the droplets thrown up into a finer spray. Generally the air from the fans will contribute to this destruction of the droplets as well. One other ingredient is usually added to the water and that is a blue dye. This dye does nothing to colour the water's surface but reduces the opacity of the water to help hide the many hoses, cables, ropes, tracks and other equipment used to control the models and generate various effects. It is impossible to light the water as it is transparent, the bottom of the tank receives all the light and is therefore best made a dark colour or black so as not to be visible in the shallow depths. It is the reflective nature of the water's surface that imparts the colour that is photographed and that is contributed by the painted sky backing or at some facilities the real sky. The camera angles are usually low enough that the reflected sky is all that is seen. Higher camera angles such as a point of view (POV) from an aircraft or helicopter present difficulties in that the bottom of the tank may be seen. In this case more than a dye may have to be employed to make the water more opaque. One solution is to add diatomasceous earth, a white powder used in pool filters, which is actually tiny plankton skeletons. This when added to the tank makes for a very realistic micro-particle-filled sea water, helping to cloud it without looking milky. It will gradually sink to the bottom and needs to be kept agitated with a blast from a hose or fanned underwater to keep it swirling in suspension. It is also good for underwater shots again contributing that swirling particulate found in sea water. It does contain a silicate which in its dry powdered form is an inhalation health hazard. Once in the water it presents no known hazard unless you intend to breath the water and then it will be drowning that will kill you, it is easily filtered out by most pool filters which contain it anyway. Sources - The technique of special effects cinematography by Raymond Fielding - Focal Press, Special effects Wire Tape and Rubber Band by LB Abbott - ASC press.